Winter mountaineering: All you need to know about it! Winter is approaching in the north and you should start thinking of your adventure endeavours this winter. Winter is not just about skiing. We definitely recommend winter ascents as the ultimate quest for an integral mountaineering experience. Reaching a summit in winter requires a combination of stamina, mountaineering skills, stable weather conditions, good temperatures and some luck. Without all the crowds of the summer, the experience is more than worth it and it can be easily combined with ski touring. Although winter peak ascents are for experienced climbers, ascending with a professional guide is always an option. Conditions may dictate the use of ice and rock gear. Approaches and descents are best done on skis and high avalanche hazard may require last minute changes in routes or dates. Why do it? Winter peak ascents are a powerful experience. There are moments full of adrenaline, unforeseen circumstances to be solved and last minute decisions to be made. No crowds, deep connection to the mountain, hardship and extraordinary rewards. The beauty of snow, the silence, strong winds and low temperatures. Winter mountaineering is definitely the ultimate test of mountaineering skills. How to start? we would recommend trying some early or late winter, easy ascents with good professional guidance on your side. Never head to the mountain alone! Snow, ice, avalanche hazards bring difficulties which only an experienced mountaineer can interpret with caution. Hiring a local guide would be the first priority! Taking lessons? Winter mountaineering needs practise. We would recommend that you take an avalanche safety & rescue course and enrol in a mountain club to share the learning process with other people. In the US reach out to AIARE for courses. In Europe Ortovox organises courses across the alps. Risk level: High. In winter mountaineering, the moto “the summit can wait" should always guide you through the experience. Do I need a certification? No, but definitely look for a guide if you are not a seasoned climber! What to buy? Essential clothing and layers for low temperatures and wet conditions are mandatory. For the rest, it all depends on the mountain, season, height, temperatures, climbing conditions and techniques. Read more about recommended gear bellow. 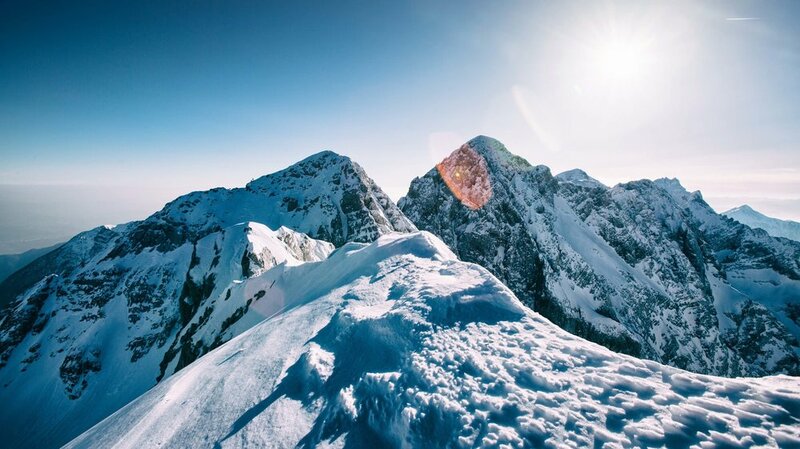 Winter climbing in the Slovenian Alps (Europe). Before heading to buy equipment, we would recommend that you buy on demand, always thinking the mountain you considering to climb. Above, we have compiled a list of a recommended optimum layering system to stay warm, not accumulating moisture and having external wind and precipitation resistance layers. Weight and packability are essential. Never use cotton! Boots: plastic double mountaineering boots or 3/4, or full shanked, stiff leather, well waterproofed, mountaineering boots, with welt designed to hold crampons. Pack – light mountaineering alpine Ascent Pack (45-55 liters). Sleeping Bag - down or fiberfill, warm to 15° or 20° should weigh less than 2 kgs. Training is possible (and fun!) even if you don’t live in a mountainous area, you just need to use your imagination to work out the key parts of your body: your core, hips, back, legs and ankles. It’s important to improve your endurance and train your strength. From climbing stairs, to using ankle weights (to strengthen your hip muscles), the possibilities are countless. In general try to have a good level of aerobic fitness in order to approach the mountain with good levels of heart and lung strength. Climbing mountains in winter is a highly demanding activity that will test your body's oxygen utilisation. Beautiful winter day in the Bernese Alps, with perfect conditions for summiting the Jungfrau. At 4,158 metres is one of the main summits of the Bernese Alps, located between the northern canton of Bern and the southern canton of Valais in Switzerland, halfway between Interlaken and Fiesch. Together with the Eiger and Mönch, the Jungfrau forms a massive wall overlooking the Bernese Oberland and the Swiss Plateau, one of the most distinctive sights of the Swiss Alps.